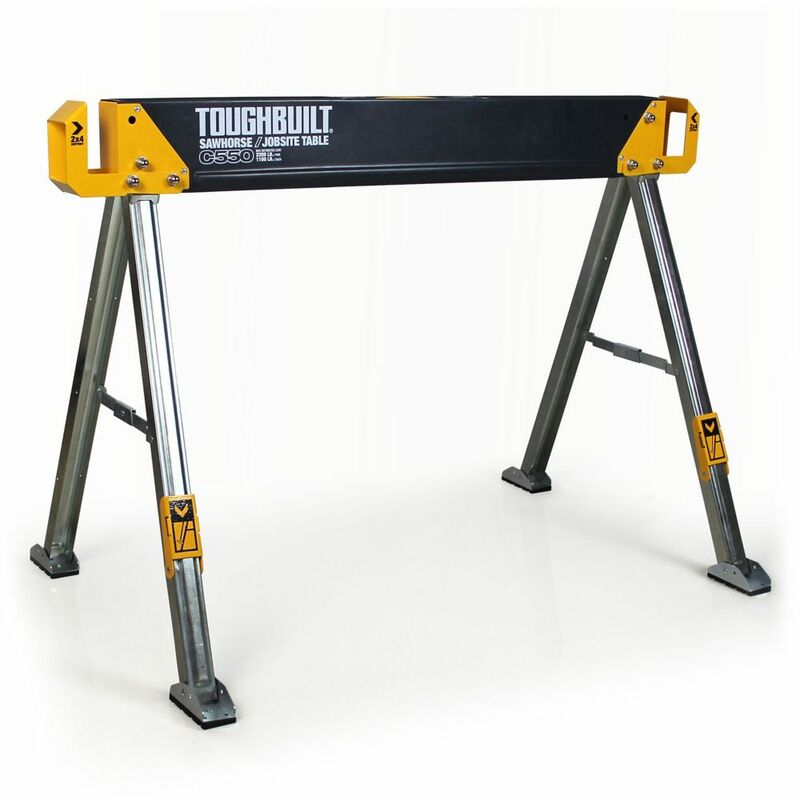 The ToughBuilt C550 Sawhorse and Jobsite Table is durable, rugged and offers unparalleled value. Constructed of 100% high-grade steel, this sawhorse has a remarkable 1100 lb. capacity alone, and 2200 lb. per pair. Features 2x4 support arms that transform 2 sawhorses into a solid jobsite table. Also includes innovative material support pegs that allow upright storage of materials and easy cutting. It also has easy-to-fold steady feet for all-surface use. With fast-open legs, setup is straightforward and simple. Powder-coated and zinc-plated steel prevents corrosion and withstands rigorous environments. This folding sawhorse includes an easy carry handle for effortless transport and rolled edges for safety and comfort. This square folding table is beneficial in a multitude of settings that include banquet halls, conference centres, cafeterias, schools and in the home. The table can be used as a temporary seating solution or be setup for everyday use. The durable blow molded top is low maintenance and cleans easily. The table legs fold under the table to make storage more convenient and for better portability. This table is commercial grade to withstand everyday use in the hospitality industry. The unique Fairmont 6 ft. Pool Table was specifically designed for smaller spaces and portability. But, don't let its size fool you, its packed with many quality features found on much larger, more expensive tables. This table features 5-inch wide top rails wrapped in a durable black melamine, fast action cushions, and a "true roll" play surface covered in a high quality, blended wool cloth. The Fairmont is fully supported by strong metal folding legs with levellers that are super easy to set up and even easier to store. This table is certain to provide hours of fun and competitive play for both children and adults alike. Includes a convenient nylon rip-resistant carry/storage bag and all pool table accessories needed to play a competitive game of pool. 180-Day Limited Warranty. For those who want to play on the best, our brand brings you top of the line tables. This high quality table is designed to meet the rigorous standards of the International Table Tennis Federation (ITTF). The Victory table features a solid 1-in thick CARB certified MDF playing surface with 20 layers of high quality coating to ensure a uniform, consistent bounce. The table is anchored by super strong 2-in diameter powder-coated steel legs and frame for exceptional stability. Eight high-grade 5-in diameter locking wheels make moving and storing a snap. The table folds at the center for individual practice. Both ends also lock and fold up for compact storage when not in use. The unique safety mechanism easily locks the table during normal play or storage. Serious amateurs and professional players will feel right at home on this table. Table includes 2 table tennis paddles and 3 balls. 1-year limited warranty. C550 Sawhorse / Jobsite Table The ToughBuilt C550 Sawhorse and Jobsite Table is durable, rugged and offers unparalleled value. Constructed of 100% high-grade steel, this sawhorse has a remarkable 1100 lb. capacity alone, and 2200 lb. per pair. Features 2x4 support arms that transform 2 sawhorses into a solid jobsite table. Also includes innovative material support pegs that allow upright storage of materials and easy cutting. It also has easy-to-fold steady feet for all-surface use. With fast-open legs, setup is straightforward and simple. Powder-coated and zinc-plated steel prevents corrosion and withstands rigorous environments. This folding sawhorse includes an easy carry handle for effortless transport and rolled edges for safety and comfort. C550 Sawhorse / Jobsite Table is rated 4.0 out of 5 by 2. Rated 3 out of 5 by Pete from Not worth the money. Assuming they come in a pair. They don't at 80.00$ a piece. Opened the legs not easy, and incredibly short. I have used dozens of work horses, this maybe the most useless strong bar's with legs. Rated 5 out of 5 by GermanMicroWorkshop from I've been in and around shops since I was about six - right at 50 years! - and one of the first t... I've been in and around shops since I was about six - right at 50 years! - and one of the first things my grandfather taught me was how to build a sawhorse. His method was all 2x4 construction. Later, my Dad taught me the better design that adds a bit of plywood - and I used those forever. When career ate my time, and two moves took my shop away, I went to a couple different brands of those plastic folding sawhorses. The bend unpredictably, and they get considerably weaker over time as the plastic ages. So I've been looking. These are skookum! So self contained they don't even sell with a box, but indeed have a hidden carrying handle they are very solid quality steel and well designed. While not as light as plastic, they weigh less than the 2x4 versions and are so much more sturdy. I especially like the rough traction areas on the top to hold a worktop, plywood, or any material from sliding. And with the end-slots for timber, if you worked with pipes or conduit for example and didn't have a tabletop, you could put a 2x6 on each side and your material would never fall off. Best design I've ever seen. This is one product you can buy without hesitation. And yes, buy at least a pair (they come as one).